Readers get all this for just a euro, plus two pull-out posters of the Vicar of Peter. You can’t buy that kind of goodwill, and to be precise, the Vatican isn’t trying to peddle it. The glossy mag is from Italian publishing giant Mondadori, whose majority owners are the populist Berlusconi family. 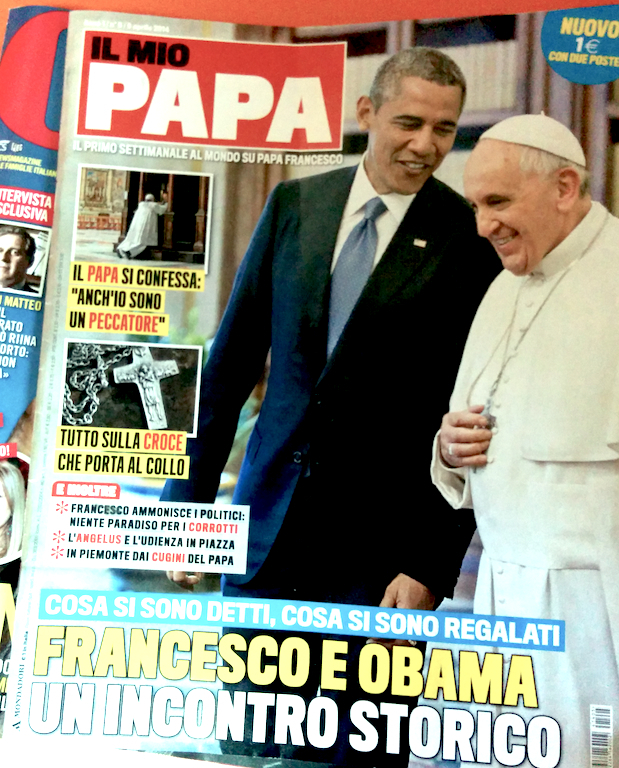 The magazine for pope-watchers got me thinking. 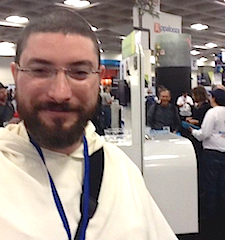 I was at Macworld in San Francisco, and one of the highlights was running into Brother Gabriel Mosher on the trade show floor. Even with the booth babes and gadget peddlers flailing about with demos, the Dominican friar was easy to spot in full religious robes. We’d met at AltWWDC last year, where I’d struck up a conversation after spotting him sitting in a talk. After living so long in Italy, I was curious about how few priests and nuns you tend to see in everyday life here, despite the declared religiosity of many Americans. Maybe they’re not in the habit of, forgive me, wearing habits or religious garb as they are in Italy, where even on tech stories I found myself interviewing them fairly frequently. (For example, when the hi-res version of The Last Supper launched at Santa Maria delle Grazie in Milan, in addition to understanding the pixels and such, I had to frantically try to remember how to correctly address the monks — padre? monsignor? just monaco?). Anyway, after chatting amiably for a few minutes, Mosher gave me his Twitter handle and I’ve been following him ever since. This time, we talked about Pope Francis, agreeing that he is something of a media mogul. Although The Holy See has long had an exhaustive online web presence in four languages, it took Pope Francis to blow up on social media. As of this writing, he has 3.88 million followers on the English account — a record for just under 300 tweets? — who receive his short, simple messages. The Pope may be infallible, but his humility is what stands out: for his one-year anniversary, he asked people to continue to pray for him. There are nine Vatican Twitter accounts, including one that captures the recent nerd-out trend of studying Latin. Each of these accounts attracts 200,000 people daily — so, the entire population of Akron, Ohio, is listening to short missives from the Catholic Church. This is where the magazine comes in. It proves that Pope Francis has gathered enough star power (or simpatia, as the Italians would put it?) to generate his own weekly. It’s an interesting take on public diplomacy: send the right message in the right medium and the commodity will follow. This entry was posted in religion and tagged il mio papa, Macworld, Pope Francis, Twitter by . Bookmark the permalink.